In my books, there isn’t a more iconic quote than this. You come to realize that the strength of an idea surpasses the one of ten thousand men after going through this beautiful graphic novel. How do you kill an idea that travels faster than man? How do you kill an idea that you cannot hold in your hands? Ideas build the foundation of progress. Ideas help insure that we don’t repeat mistakes. Ideas are every humans sword and shield. The moment that an idea manages to create doubt to our reality and instigates rationality in a captured mind, a person becomes enlightened and sees new purposes, new beliefs. V for Vendetta was published through 1988 and 1989 and was written by Alan Moore along with illustrator David Lloyd. Not to mention additional art help by Steve Whitaker and Siobhan Dodds. This story follows V, an unbelievably charismatic anarchist who seeks to overthrow the fascist government that rules a future United Kingdom’s. Wearing the famous Guy Fawkes mask, he also vows to seek vengeance upon his once-were captors and goes on to teach Evey Hammond, his protégé, a lesson to remember. This beautiful dystopian tale has you captivated from the beginning to the end. Having enough dialogue in this to make a novel alone, this graphic novel contains so much depth that it’s easy to be overwhelmed. It’s tough to land on a graphic novel that takes upon itself the burden of sharing serious ideas through an amazing plot. It truly astonishes me how well Alan Moore writes the dialogues. Every word is capable of hitting you hard and leaving a mark in every fiber of your body. Key moments in the story would show up uninvited on the next page and send a funny cool chill up your spine. SPOILER HERE: Hover over text to read. There are also other similar scenes where V would philosophize on the population and the government and make you ponder for yourself on what it takes to live in a regime that steals almost everything fundamental from you. 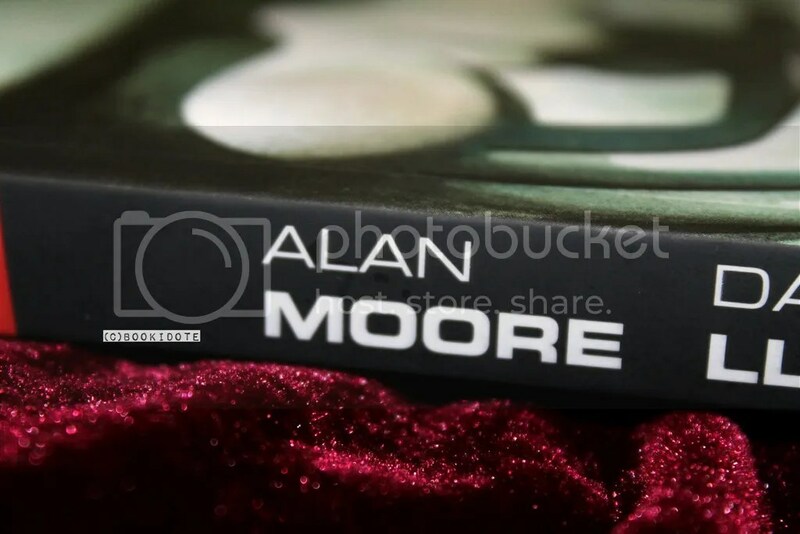 Alan Moore is a God when it comes to the comic world (see The Killing Joke review for more praise from my part). He does an amazing job at telling the story of V and immortalizing this character in our society. If you ask me, the Guy Fawkes mask knew its pinnacle of fame the moment this comic hit the shelves. Artwork has always seemed to be on point when Alan Moore’s ideas needed to be portrayed in perfection. David Lloyd and his fellow artists did an absolutely amazing job at illustrating the characters and making everything so vivid with so little colors. In fact, I could have sworn that the whole graphic novel was only drawn with a pallet of less than 10 colors. With just the basic three colors (red, yellow and blue) and some additional ones, they were able to create an absolutely dazzling work. One scene that I personally thought was amazing, that showed brilliant chemistry between art and message is in Book Three of the graphic novel. SPOILER HERE: Hover over text to read. I absolutely loved how the art helped deliver the message that V was explaining to Evey Hammond. I’d have to say that every frame was very well organized. Everything was beautifully thought and executed. Not to mention the subtle and clever titles that all start with a V. Isn’t that valiant? As if the artwork and plot wasn’t mind-boggling on their own, the characters were also perfect throughout the story. V, obviously being the most intriguing and unavoidable protagonist of this tale, shows so much wit and charisma, that it becomes pretty hard to not fall in love with him. Representing an idea, this man carries so much knowledge and a fascinating desire for vengeance that you cannot escape the need to applaud and encourage him in all of his actions. 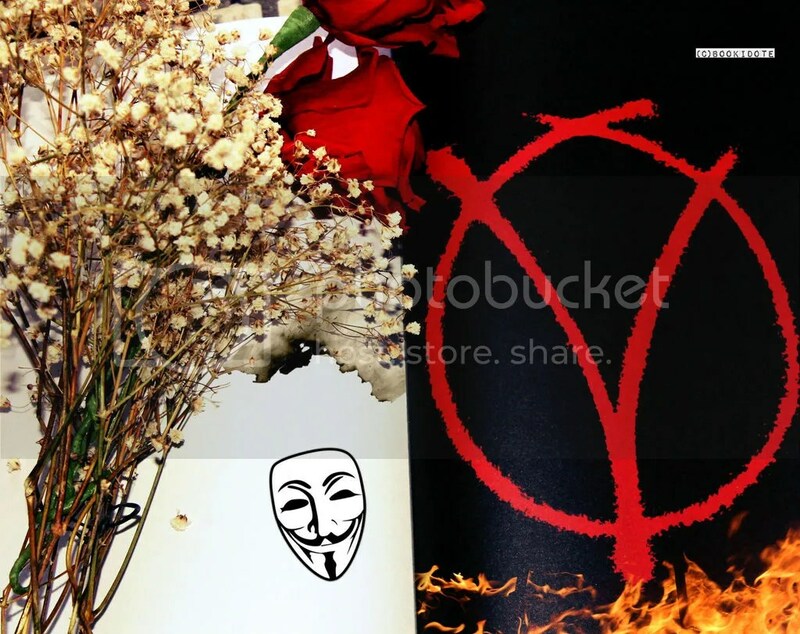 Anarchy couldn’t have a better leader than V. No wonder we find ourselves in an age and time with so many Guy Fawkes masks among activists groups (as well as more radical groups like the well-known Anonymous group). On the other hand, Evey Hammond was also an absolute delight to follow in her adventures. She is after all portrayed as V’s protégé in this plot. What’s very compelling in all this is how you can see her evolution as well as how she gradually becomes free of all the strings the regime had on her. She slowly regains control on her conscious and builds herself into a plot ending that’s sure to get your own blood pumping. The ending of this novel makes up for one of the best endings Alan Moore has ever set out (as if he had ever had a problem finishing grandiosely in his graphic novels). Anarchy has often been seen like a load of chaos with a cherry filled with disaster on top. This novel helps you better understand how anarchy is not only an idea with several ups and downs, it’s also a solution to fascism. Obviously, the graphic novel helps portray anarchy in its purest form, as an ideal that would work and not be corrupted by greedy men. This brings us to realize that what V does in the book is almost impossible to execute today. Anarchy is bound to go bad at some point during the process. It would only take one bad apple among a group of anarchist to turn this into another dictatorship. It would only take one person to push the ideas too far. We live in a world where we cannot function without someone leading us. This leader will, intentionally or not, pinpoint the flaws in an anarchy and be able to grow on these elements, to feast on the weak and to linger in avarice. Besides this point to keep in mind, this graphic novel helps us entertain the idea of a anarchist revolution without flaws. An ideal that had a perfect transition from theory to practice. I would say that that was pretty well accomplished. V for Vendetta shows a population that regains control on their freedom of speech, their Voice, in order to be heard and understood. A voice strong enough to get the government to fear them and not the other way around (just like one of the famous quotes from this graphic novel says). This novel does an amazing job at making us understand that V lives in all of us. That V is not just one person. He’s an idea that anyone can have in them. V is immortal. He shows us that the People will always have what it takes to make their lives better. They only need to acknowledge that and unite. Alan Moore’s work never seems to be overlooked and maybe that’s just a sign that his work deserves a read. 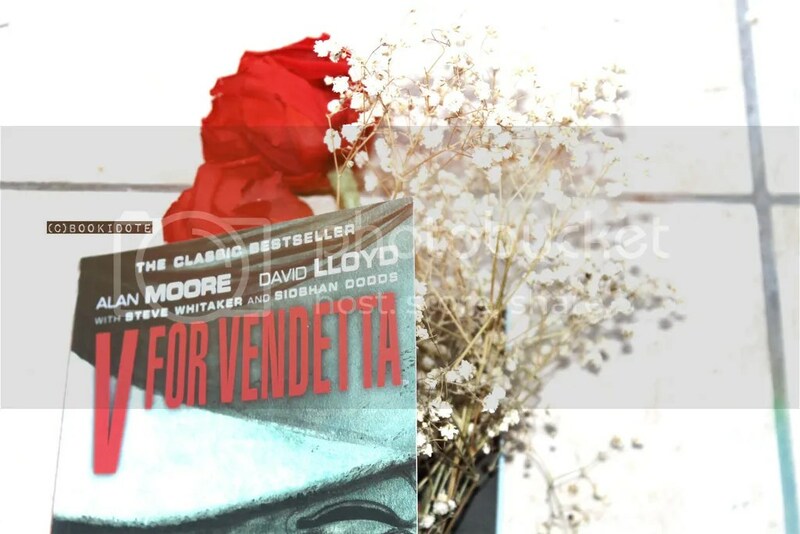 V for Vendetta shows that the comic medium isn’t to be treated lightly. It shows that complexity comes in various forms and it only takes great minds to get things done. This graphic novel covers a great array of ideas and ideas push us to reflect on our values and beliefs. Mixing a great political analysis with a breathtaking terrorist hunting storyline, this graphic novel is bound to keep you hooked for days. V is definitely a character that you should acquaint with and what better way to do this than to get your hands on a copy of this graphic novel? 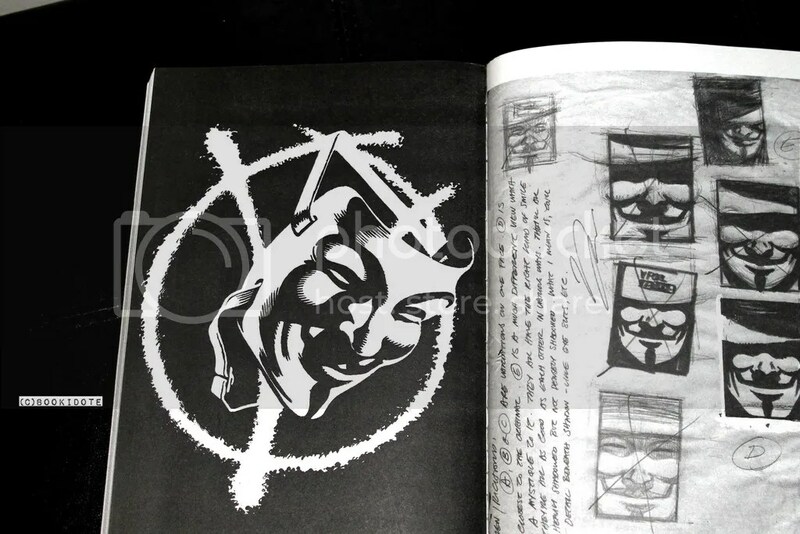 I assure you, once you’re done with this graphic novel, you’ll want to run around with a Guy Fawkes mask and a black cape! As always, share your thoughts on this masterpiece with us in the comment section and make sure to like and share as we continue to bring you interesting reviews to read and enjoy! Oh em gee!! Let me get this straight. I LOVE THIS REVIEW SO MUCH ! 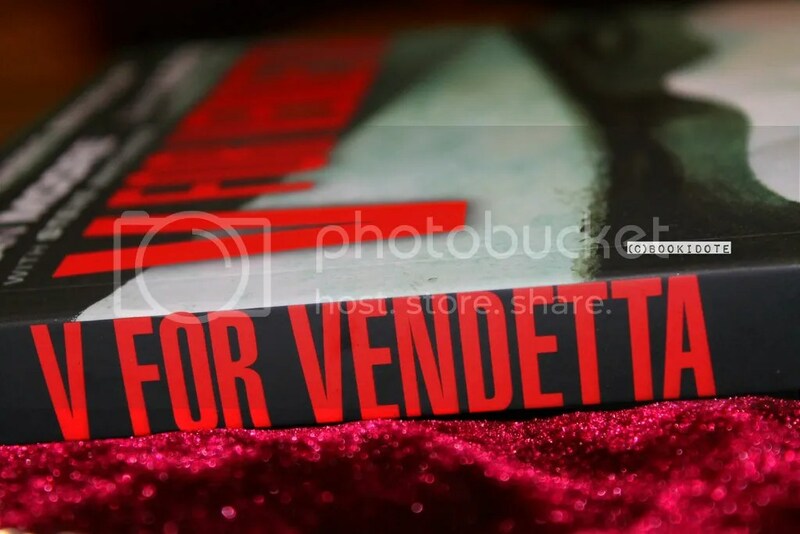 AHHH I randomly typed V for vendetta review on google and fall on your blog . I JUST finished it and I had to see what people think about it . I’m happy to say that you covered everything I wanted to say about this book from the introduction to the detailed spoiler. Btw thank you for the missing info there in the spoilers hahah 😉 I didn’t know Alan Moore is that popular I will look for his other works ! Do you have any suggestions not comics related just stories ahah ( no hate at all I just dont have time to start to plunge in the comics world yet ..its so vast and scary ) on grah novels? This graphic novel is a great read. You’re bound to enjoy its content if you ever get your hands on a copy. Thank you again for sharing your thoughts on the review, it’s really appreciated ! Glad to see a common face among our followers. V for Vendetta is just one of many movies I love but have never read the printed counterpart. I’m doing a reading challenge (50 books over the next 5 months; see my blog!) and I’m going to need a graphic novel. This might just be the perfect choice! Nice review. Thank you so much for checking out the review and reading through it ! It’s really appreciated ! We will definitely tag along your reading challenge and see how you progress there hahah ! 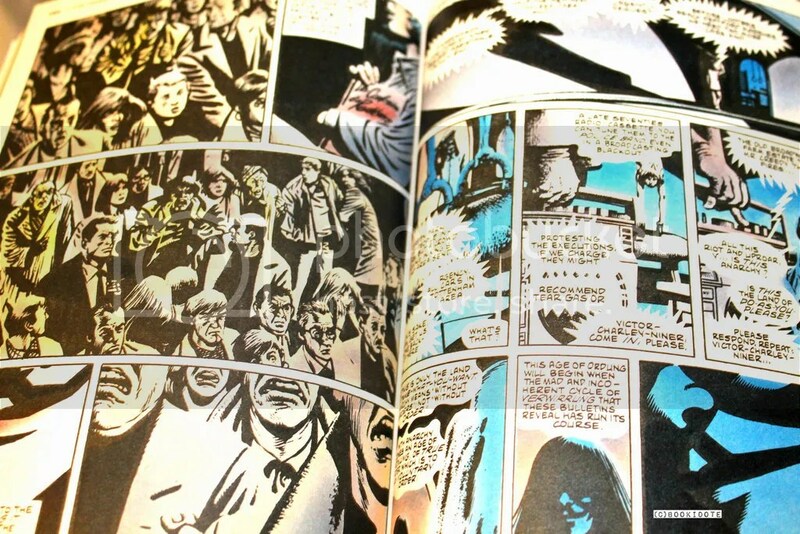 If you enjoyed the movie, you’re sure to adore the graphic novel. It sends its messages with so much more power. There’s also less Hollywood-must-have-scenes throughout the book (which is a great thing if you ask me :P). Thank you again for checking out this review, hope you’ll stick around for our future posts ! Hey thanks for reading my movie review and recommending this to me! I completely forgot that this was a graphic novel. Love it! I’m gonna buy my own copy next chance I get! Sure thing man! Glad you enjoyed it! Hope you’ll find some joy (although the graphic novel is pretty dark and suffocating) in reading it! It’s a true gem! Hope we’ll see you again on our future posts! Thanks for the awesome review! It’s helping me temporarily forget that I still need to review Fantastic Four. Yuck. Fun fact: while Guy Fawkes is generally seen as an anarchist symbol, he was actually a catholic fundamentalist. The gunpowder plot was an attempt by him and his fellow conspirators to inspire a popular uprising, which would result in a new, Carholic Great Britain. More proof of the power that a symbol can have to people, I suppose. Oh boy, I feel bad you even have to think about that. We haven’t watched it yet (going to on tuesday). Man, good luck on that ! Seems like you’re about to let looose some seriouuus criticism cause that movie sure didn’t perform from what I’ve heard. Part way through reading this myself, like the best comics work it’s a literary and visual masterpiece. Great review! Thanks man, greatly appreciated ! You’re bound to see some great scenes once you get towards the end, it’s really an amazing work !